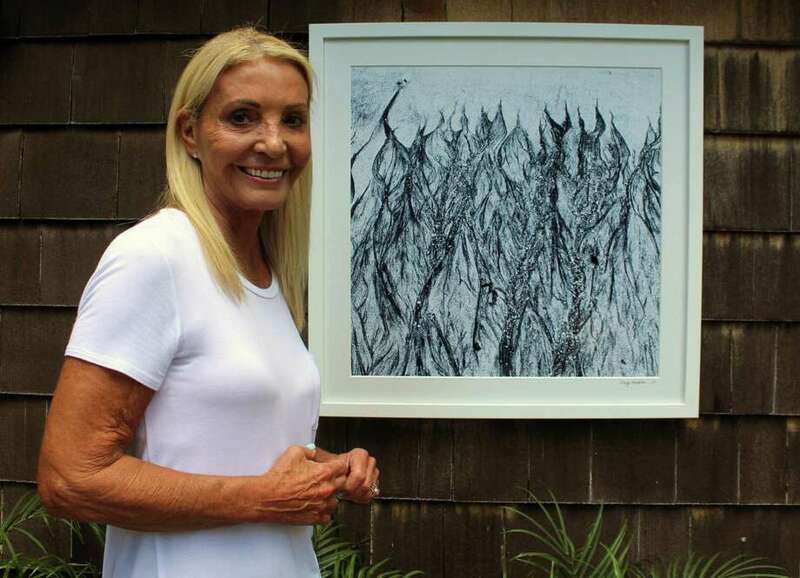 Photographer Nancy Breakstone poses in front of her photograph, “Spirals,” at her home in Westport on Aug. 2. WESTPORT — “Waterwoman.” That’s how resident Nancy Breakstone describes herself. Raised in Greenwich, Breakstone spent her childhood on the beach sailing and painting water fowl and, as an adult, excelled in water sports. In the 1980s Breakstone raced sailboards while in her 30s. When she was 60, Breakstone discovered stand-up paddle-boarding and went on to compete professionally in the sport, including at the World Paddle Association Nationals, beating paddlers more than half her age. About five years ago, Breakstone started a stand-up paddle board junior race team in Westport and a paddle-board lesson and tour company in Norwalk, both of which she has ended to make way for the water’s most recent gift to her: a photography career. Breakstone has shot photos for personal use all her life. Six years ago, while on vacation to the Costa Rican beach Playa Negra with her husband, Bill Kutik, Breakstone fell in love with a specific photographic subject. “I’d be walking the beach and see these images come up and thought, oh my God, where’d they come from?” Breakstone said. volcanic beach full of lava rock, and when the waves hit the shore, the water sinks into the sand and forms images that resemble natural objects, such as seaweed and trees, and other purely abstract forms, Breakstone said. Since that first trip, Breakstone has returned to Playa Negra for about 10 days twice a year — without Bill, who is not a fan of the 100-degree weather — to capture images of the beach. The encouragement of friends helped Breakstone overcome her original hesitation, and last year she joined the Cultural Alliance of Fairfield County and submitted her photos to art shows across the country. In a standout first year, Breakstone’s work has been featured in 20 group shows, 10 of which were juried, and two solo shows — one at the Gallery at Grain Surfboards in Amagansett, N.Y., and the other, titled “Impressions in the Sand,” is on view at Pour Me Coffee & Wine Cafe in Danbury until Sept. 14. Breakstone credits her photography success in the midst of her 70th year to her competitive spirit and powers of reinvention. Breakstone has raised horses and bred Jack Russell terrier dogs. In perhaps her greatest reinvention, she left a 25-year marriage and life in Bedford, N.Y., and 12 years ago moved to Westport to join her then-boyfriend and now-husband Bill in Westport. More important to her photographic achievements, Breakstone said, is her attentiveness and reverence for the ocean. While Breakstone uses a blue filter on her photos to enhance the natural hue, she doesn’t Photoshop her images because she wants people to see exactly what she does while traipsing the beach.